Roast marshmallows to perfection with this whimsical skewer shaped like a twig. Call off your search for the perfect roasting branch, and cook marshmallows to perfection with this twig-inspired skewer (dirt not included). 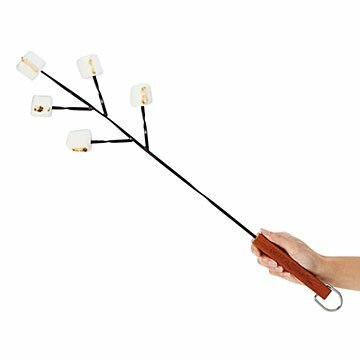 Featuring a whimsical design to reflect old-fashioned roasting sticks, you'll brown up to five marshmallows at once, which you can then smash between graham crackers or simply devour in all their plain, gooey glory. Designed in Berkeley, California. Made in China. Wash with a mild soap, rinse, and dry immediately. This is such a creative gift idea. Can make a bunch of s'mores all at once! We go camping frequently and I thought this would help with the amount of grilling we do while in the outdoors! Haven't had a chance to use it yet, but it seems easy to clean and like it will help out a lot. Bought it as a gift for my stepdad and he loved it. Only thing that would make it better is if they were longer. Can't wait to give it! We never see to have enough marshmallow skewers. Can't wait to see their faces (11 yr olds) when they open this gift and that it goes with their parents gift of a new fire pit. I would use it for roasting marshmellows for making s'mores. A great way to cook multiple marshmellows! Perfect for avoiding fights as to who gets the marshmallows!